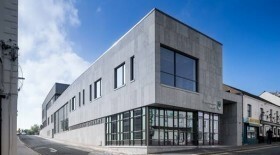 Arklow Civic Library and Municipal Offices is a recent, significant development undertaken by Wicklow County Council. The building is centrally located, on the Main Street of Arklow Town and it provides a valuable facility for the local community, as well as a modern office environment for Civil Servants and staff alike. Like all major construction projects, there were a number of challenges to be addressed to meet the requirements of the development. Arklow is a heritage town and the building is situated on a narrow, steeply sloping site, with a lot of footfall and commercial activity around the site. This presented two issues – health and safety concerns and the need for a design compatible with the steep incline. The time-line for the project was also extremely tight from the outset, to minimise disruption in the town. It was decided to develop the building on the basis of a split-level building design. The creative and practical architecture enables the building to facilitate a whole host of activities and requirements. The building extends approx. 1,500 Sq Metres in area. Internally there are is a series of varying spaces, including a children’s areas, book stacks, reading rooms, IT zones and offices / meeting rooms. These areas are interlinked vertically through a series of voids allowing daylight to penetrate into the heart of the building. Externally the building facade consists mainly of stone and zinc cladding and , to a lesser extent, glazed curtain walling. The designers (Coady Architects, DBFL Engineering) made impressive use of the limited external space available to create a welcoming courtyard area at the south entrance. All parties involved in the project worked towards a demanding completion date, which required a very close working relationship between the Design Team, the Employer and Main Contractor, Purcell Construction Ltd. The Main Contractor has to be commended for the highly efficient and effective way in which they controlled and managed the construction of a 1,500 Sq/m building on a busy town centre location, with little or no interruption to the local community or surrounding buildings. One of the primary concerns for any contractor is the safety of all those involved in the project and for the local community in the vicinity. Purcell Construction implemented best practice in terms of Health and Safety procedures as it was recognised that was also of paramount importance on the project. As a result, , the building site remained a safe environment to work in throughout the duration of the build. MMP provided the Client with professional Quantity Surveying services, along with pre and post contract management expertise. At the feasibility stage, our primary role was to advise on a design brief that would suit their the Client’s budget, and also assist the designers in meeting the requirements of the design brief. Following agreement on the design and budget, we were requested to prepare tender documentation, complete due diligence on the tenders returned and we assisted in appointing the Successful Tenderer to the project. In our role as Cost Managers we (MMP) were responsible for assessing monthly payment valuations, agreeing change order values and the conclusion of the final account process. We are delighted to announce that the building was officially opened to the public on 1st April 2016 by Cathaoirleach of Wicklow County Council, John Ryan and the Cathaoirleach of Arklow Municipal District, Sylvester Bourke. Arklow Civic Library and Municipal Offices has been nominated for several awards including ‘Best Public Building’ at the LAMA awards 2016. It received an award at the CMG Irish Building & Design Awards 2016 for Best Cultural Building. The building is testament to how integrated teamwork and enthusiasm can bring about exemplary results. The Clients have expressed their deep satisfaction with the building and we wish them every success in their new setting.